Did the former NFL star use my #5 blog profile questioning his return to football as pre-match motivation to knock the stuffing out of Scott Carson just 3 minutes into round 1? Whether he did or not, the big man's now 2-0 in the ring. Sorry about that, Mr. Walker--you can go ahead and do whatever you want. Just don't kill me. This week (late Jan 2011), former NFL star (and current mixed martial arts fighter) Herschel Walker said that he'd like to return to football at age 48. Not sure if that's predicated on the looming work stoppage and some kind of replacement team for locked-out union players, but his comment made for an interesting pre-Super Bowl distraction and tangentially reminded me of 70s underwear model and Oriole HOF pitcher, Jim Palmer. 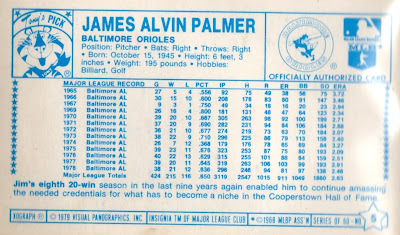 Palmer retired in 1984 with 268 wins, 3 Cy Young awards, and 3 World Series rings, all excellent support pillars for HOF election in his first year of eligibility. 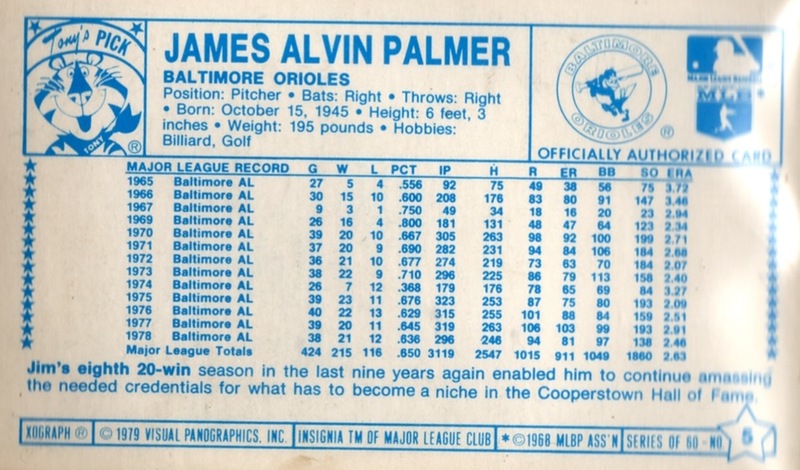 Many considered him a shoo-in for Cooperstown by the late 1970s, both for his personal fame ("underwear model" will do that) and as a key piece of Baltimore's great success in the 1960s and 70s. Walker's announcement took me back because Jim also un-retired in 1991--a year after reaching the HOF--and joined Baltimore for spring training. Jim's comeback only lasted two innings of a single game, however, before he hung 'em back up--and that's in a non-contact sport. There's no questioning Herschel's toughness (MMA at 48! ), but expect the same story to play out should he try a gridiron return. Kellogg's settled into their sorta-3D niche by the late 1970s and this 60-player set repeats what worked for them throughout the decade. 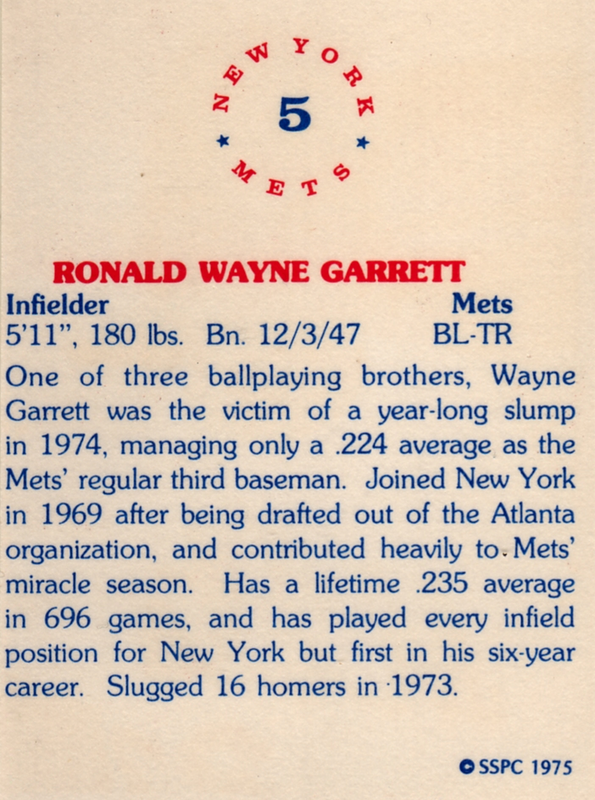 According to the Key Man Collectibles 1979 profile, three print runs spawned a bunch of variations, so the master set contains over 100 cards. 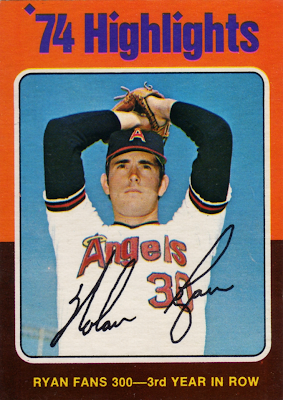 Value: Most Kellogg's cards cost a dollar or two and even less if they have any surface cracks. Find Palmer and plenty of others at Check Out My Cards. Fakes / reprints: Haven't seen any Kellogg's fakes in the marketplace. 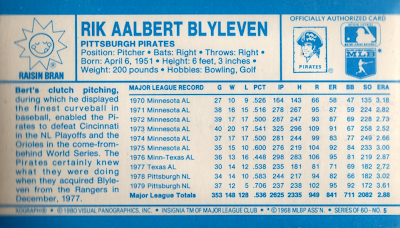 2011 Hall of Fame inductee Bert Blyleven played for 5 different teams across his 22 seasons, but one of his seasons, Pittsburgh's 1979 title winner, stands out as enigmatic for a guy used to taking the mound every scheduled day, year after year. Could it possibly be odder than those black-on-gold beehive hats and wide-wale pant striping? Let's find out. 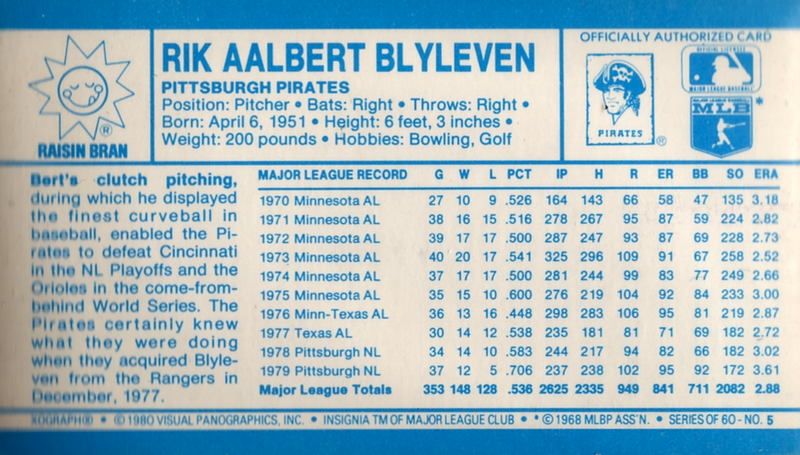 Blyleven went 12-5 in 1979 and struck out 172 batters, totals that seem low for his 3.8 WAR (wins above replacement), which placed tops on a pretty good Pirates staff. Seventeen decisions looks like a guy who spent time on the DL, but Bert took the mound every scheduled time, 37 starts in all. So how did all those appearances become "only" a dozen wins? Based on 1979's box scores, Bert went two weeks between decisions five different times, a steady pulse in the arc of his season. 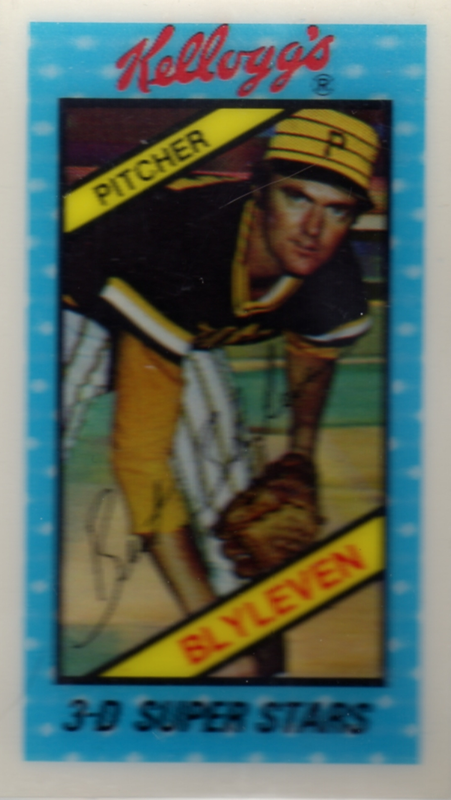 On opening day, Blyleven threw 7 innings of 2-run ball, but Pittsburgh lost in 10 innings. By my count, he started 9 different games that went to extra innings, a lost cause for pitcher wins no matter how good their curveball. I'm sure he doesn't begrudge the World Series ring, but there must've been frustrating days watching from the bench. "Bert's clutch pitching, during which he displayed the finest curveball in baseball, enabled the Pirates to Cincinnati in the NL Playoffs and the Orioles in the come-from-behind World Series. The Pirates certainly knew what they were doing when they acquired Blyleven from the Rangers in December, 1977." UPDATE: Kellogg's offered this 60-player set in various brands of cereal, but specifically featured Raisin Bran on card backs. Collectors could acquire them one-per-box or buy the complete set by mail order. Value: Kellogg's singles run a dollar or two. Cards quality improved by the late 1970s and their plastic fronts tend to crack less than early sets. 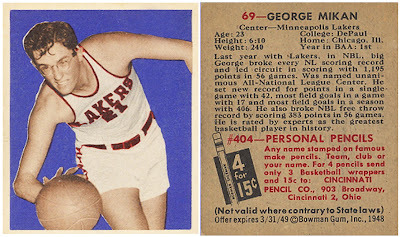 Fakes / reprints: Doubt anyone would try faking Kellogg's cards and haven't seen any in the market. Collectors know these artful 6" x 8" cards by three terms: T3s (catalog number), Turkey Reds (associated tobacco brand), and, more generally, "cabinet cards" (for their large and presentable size). This bigger surface meant more chances for damage--note several dings and marks on its "frame"--but there's no denying their appeal. I'd even call them "classy." 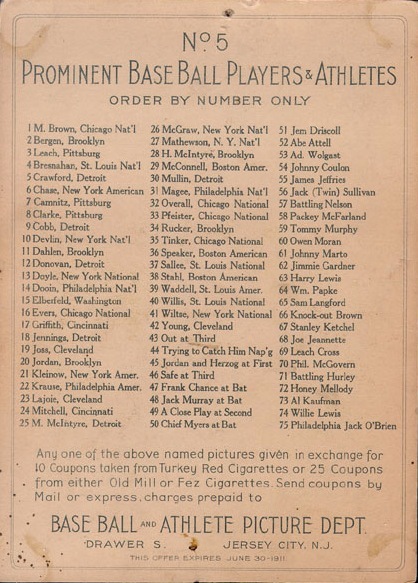 Turkey Red backs show the entire checklist, a mixture of baseball players, on-field action shots, and pro boxers. Individual panels start around $100 and HOFers cost much more, so building a complete set takes real money and dedication. Value: Low-grade Crawford cards run a few hundred dollars, given his HOF status and popularity with Detroit fans. Fakes / reprints: Several T3 reprints exist and there's no doubt people faked the most valuable stars. Modern companies also adapted the painted look for 21st century players, one of the best throwback designs to choose from. After more than 100 years of collecting, how many mysteries remain? Cards-as-investment frenzy peaked in the 1990s, coaxing forgotten treasures from attics and estates as folks hoped to score a big-money find. Tons of little-known ephemera entered the market, leaving experts to puzzle out authenticity and market values. Alan Alda and Matthew Broderick even personalized the hunt for cardboard gold in a 2008 movie. Hobby knowledge grew by leaps and bounds in the last 20 years, leaving remaining unknowns in a realm of the completely obscure and dismissible. Imagine a kitschy photo paper that started blank, but revealed pictures if you rubbed water (or spit) on it and let it dry in the sun. Would you keep them around? 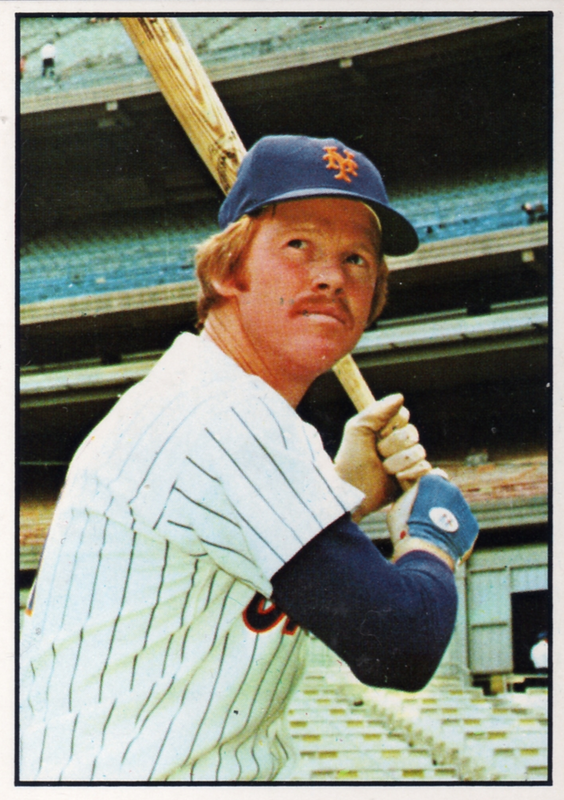 That's the rare (and still mysterious) Topps Hocus Focus. 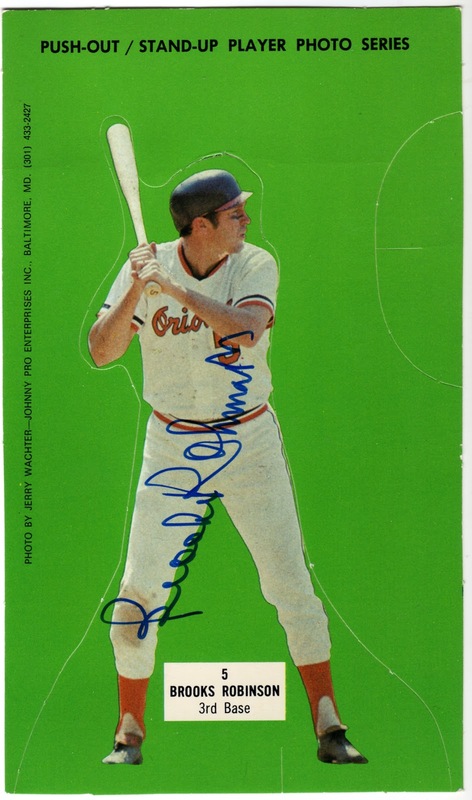 Hocus Focus collectors continue to publish their research into this ugly duckling set on forums like Net54Baseball.com, including this essential thread of scans and publishing schedules. 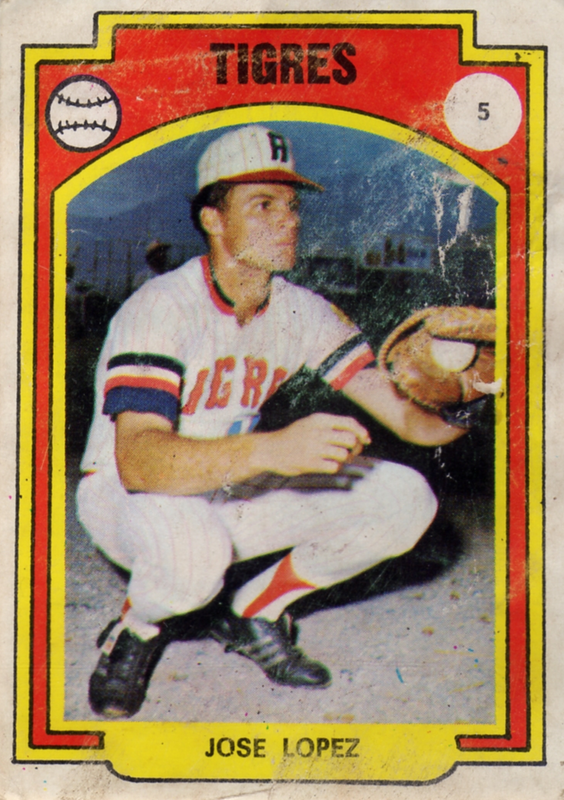 It appears Topps developed (no pun intended) the "water and light" photo effect over several years, with 1956 as its apex--or at least their final set based on it. Not sure if buyers would take to this photo technique in the 21st century, but Allen and Ginter's always full of surprises. 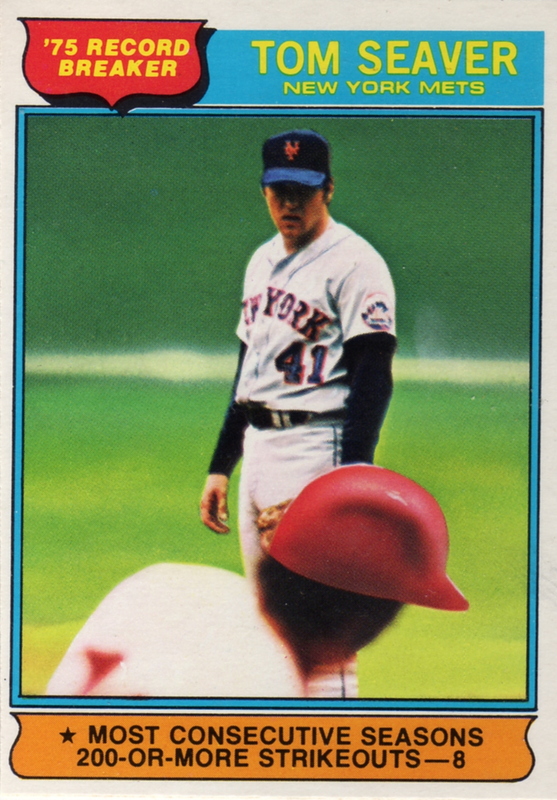 Would you be interested in Topps bringing back their spit-developing cards as a gimmick? 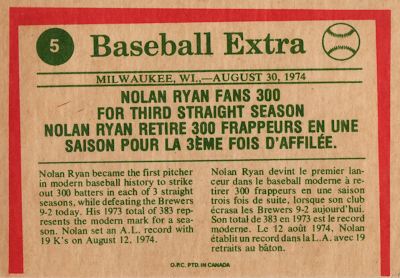 Fakes / reprints: This set's valuable enough to fake, but relatively low-demand. Check out the Net54 thread for info on each set, so you know how to distinguish them. I've always been intrigued by the fluid nature of baseball's scoring. More than 90 percent of on-field plays are easily identified as hits, Ks, or fielding outs. Ghastly errors also stand out and make fans like me feel a little better about our limited skills. At the borderline between "clear hit" and "awful play" lives the official scorer...and controversy. Let's say this happened in a Yankee game. Who would YOU give the "no catch" error to, MVP candidate Robinson Cano or HOFer Derek Jeter? Smack-A-Roo candy used an interesting package design and this numbered card's actually a back panel for the product itself, like 1970s Hostess snack cake boxes. The three perforated edges held it together and kids got to its candy by pulling on the "smooth" side. Tearing apart a box to get at its contents means very few Smack-A-Roo panels survived initial purchase, let alone into the modern age. 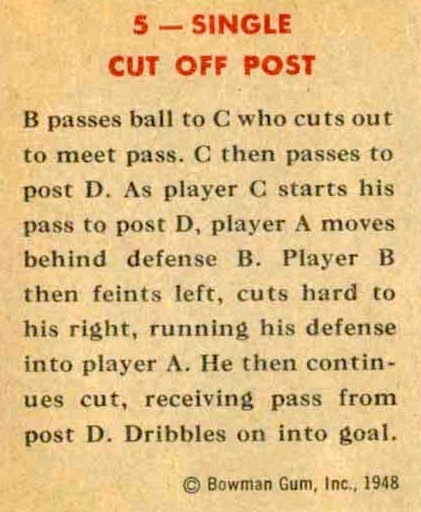 (More kids also would've saved real players over Q-and-A about scoring decisions.) They're unusual cards and little-known within the hobby. Value: OldCardboard.com values VG commons about $35, but I found this panel on eBay for $20. Fakes / reprints: Haven't seen any in the market and it'd be tough to fake the weird shape. Bowman's hand-tinted coloring of black-and-white photos precedes their 1949 baseball issue, so is the first appearance of this love-it-or-hate-it design. 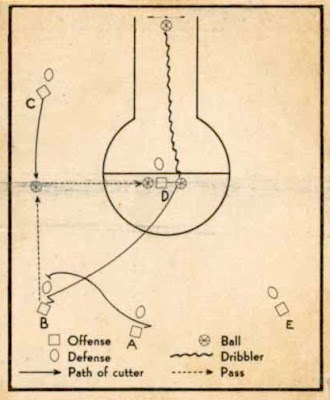 The set also interspersed bird's eye diagrams (like this #5) with their player photos, probably to help new fans understand on-court strategy and action. 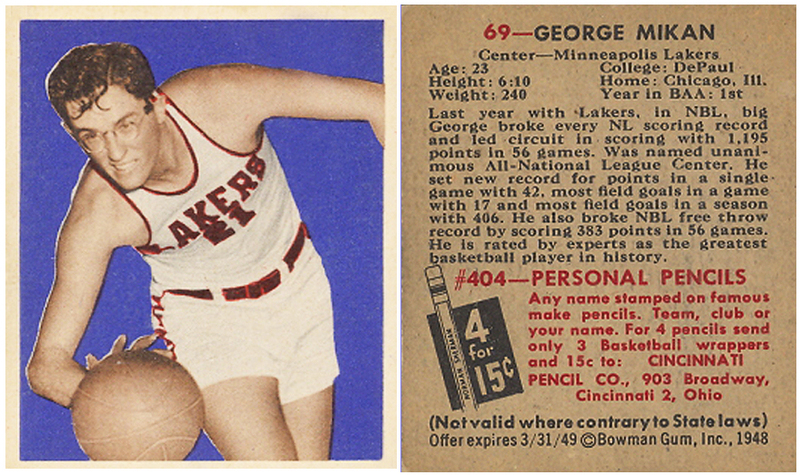 Its 72-card checklist contains the Mona Lisa of basketball rookies, Hall-of-Famer George Mikan. Compared to Mikan's detailed bio back and "famous make pencils" ad, the diagrams read like simple "INSERT TAB A IN SLOT B" instructions from high school shop class. Most of these plays remain basketball staples, despite the overall evolution and sophistication of modern offenses. 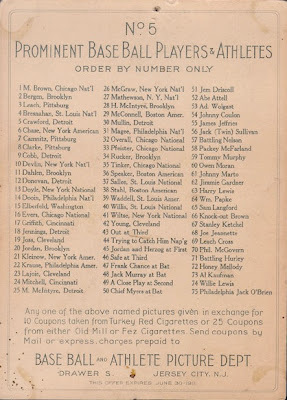 Value: Based on eBay searches, dealers charge $10-20 for low-grade 1948 diagram cards. Actual players cost more and stars (mostly Hall of Famers) jump much higher, given the rarity and demand. 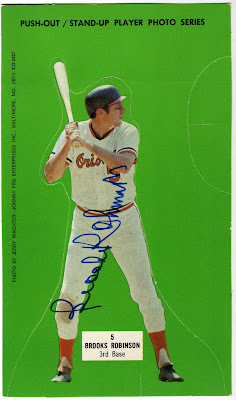 Fakes / reprints: Bowman reprinted this set as an insert in 2009, so look for that date on card backs. Wow, been a while since we've profiled a site follower in the Type Site series, so let's jump back in with Section 36, a Boston-area chap who authors a baseball blog by the same name. Hmm, wonder who he writes about? Section 36 blog burned up 2010 with 281 articles posted, a great total for even professional writers. Find everything from articles on baseball cards and memorabilia to personal stories and open questions (i.e., Are the Sox actually sending Julio Lugo paychecks?). One my favorite Yankee-Red Sox digs came from the Blogs from Other Teams request, where he asked folks to nominate other fan writers to follow. Check out this pair of comments. "Here are two great blogs from the greatest team in the land!" "Adam, I think you gave me the wrong links. Those were Yankees blogs." ZING! With apologies to Adam, that's quality comeback-ery. Section 36 also runs off-season contests (for cards + other booty) and 2010's version remains OPEN until Feb 9, 2011! Check his 2010 Scavenger Hunt post for details and then go hunting for those photos. I've long been fascinated with winter baseball, since many players follow warm temperatures south once America's regular season wraps up. Venezuela, Puerto Rico, Mexico, and the Dominican Republic all own long league histories, with a vast number of Latino players starting their careers there. Since it's effectively another "minor league" (but stocked with big-league talent), MLB maintains an active presence there and every organization fields dozens of farm system prospects. 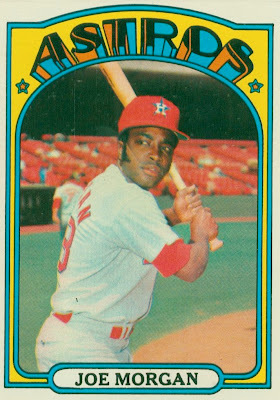 Being 1972, this isn't Jose Lopez, the former Seattle (and now Colorado) infielder. Instead, it's Jose Angel Lopez, a Venezuelan native who spent 7 years in the Houston and St. Louis farm systems (minor stats at B-R.com). It was nigh-impossible for fans to track multi-country prospects in those days, but MLB.com now gathers off-season pro ball in five countries under their Winter League home page umbrella. These links alone all taught me things I didn't know. 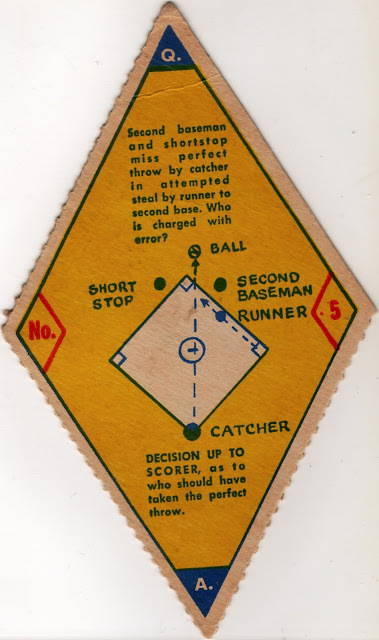 Venezuela loves baseball with a capital "L" and local leagues printed their own cards as far back as 1916. 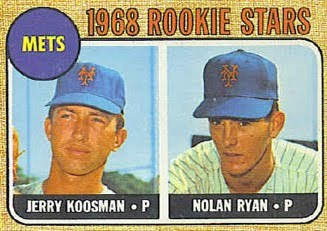 Many post-war designs crib directly from Topps American sets or follow them in spirit. 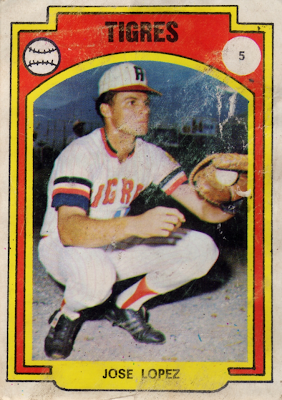 Their 1972 issue took a stab at the psychedelic look, with high-contrast borders and player name on the bottom edge. (Card numbers move to the front, since they're really blank-backed stamps destined for mounting in team albums.) 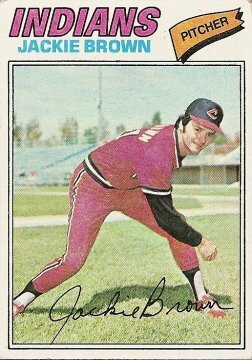 The excellent Caribbean card site CubanBall.com hosts a more-or-less complete gallery of past Venezuelan sets. Value: Mr. Lopez cost $10 on eBay a few years ago. Venezuelan cards are affordable if you avoid the big league stars. Fakes / reprints: Haven't seen many foreign fakes in the market and it'd be tough to make money reprinting 1970s Latin American sets. 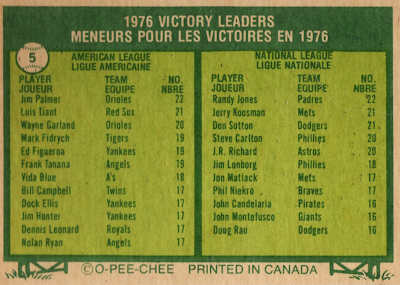 1979 marked the 15th season that Montreal-based candy maker O-Pee-Chee licensed a baseball set design from Topps for their Canadian customers. 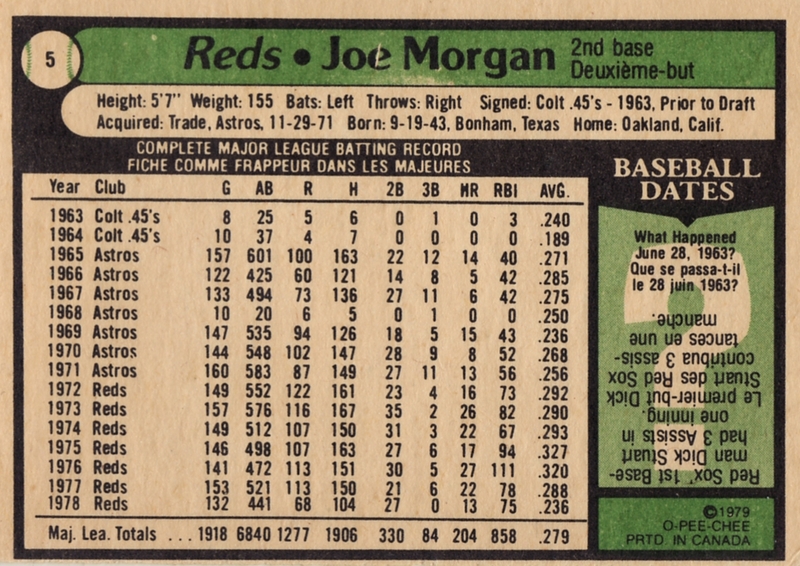 It included "only" 374 cards, just half the 726 found in America's set, but otherwise matched its spirit and execution. 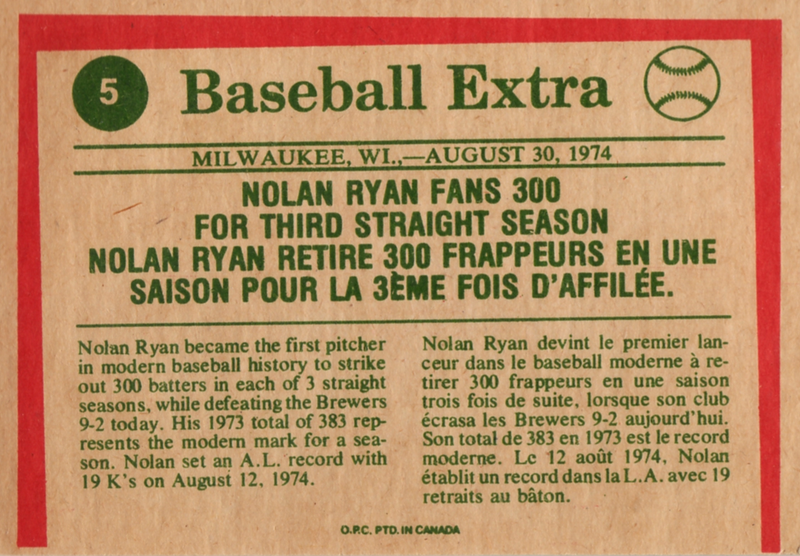 Canada loves them some hockey, so I'm pretty sure OPC designed and printed baseball cards late in the NHL season (i.e., April) and sold them during the puck-free summer months. 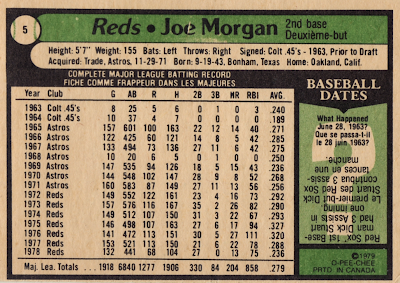 This brief selling window probably led to its shorter (and less expensive to print) set size. 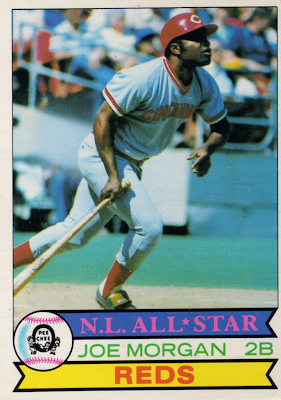 In my opinion, Topps action photography really improved by 1979 and Morgan's just one example. Face shadows aside, that's great timing on a high shot to right field. 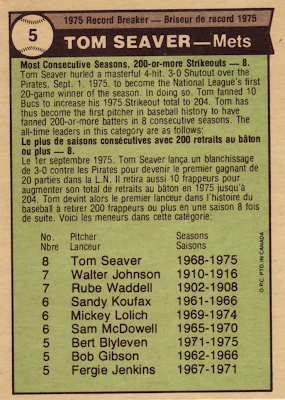 OPC started with the Topps template in 1979, but mixed things up a bit in both checklist and card design. All cards feature individual players--no league leaders or record breakers. Players who changed teams before opening day get "now with..." notes on the front. 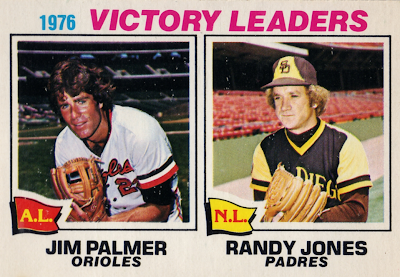 See the annotated checklist at Super70s.com for more on these details and a comparison of each team change at Oh My O-Pee-Chee's 1979 card profiles. 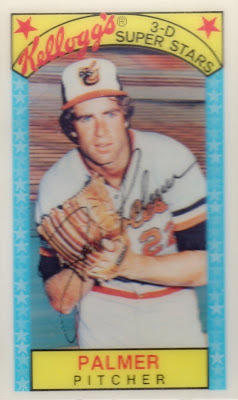 Value: Like most 1970s-1980s stars, ungraded Morgan cards cost a couple dollars at most. Tom Terrific comes right to mind in any discussion of all-time pitchers, given his overpowering fastball and full award shelf, including 1967's Rookie of the Year, 1969's World Series title, a trio of NL Cy Young awards (1969, 1973, 1975), and 13 All-Star selections. 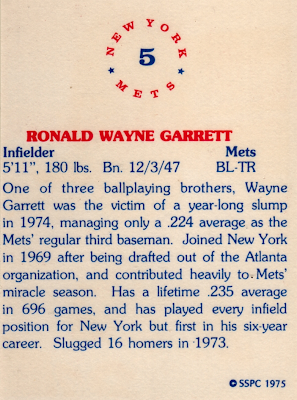 While his career after age 32 slowly dropped to just "great," that first decade rates as "otherworldly." 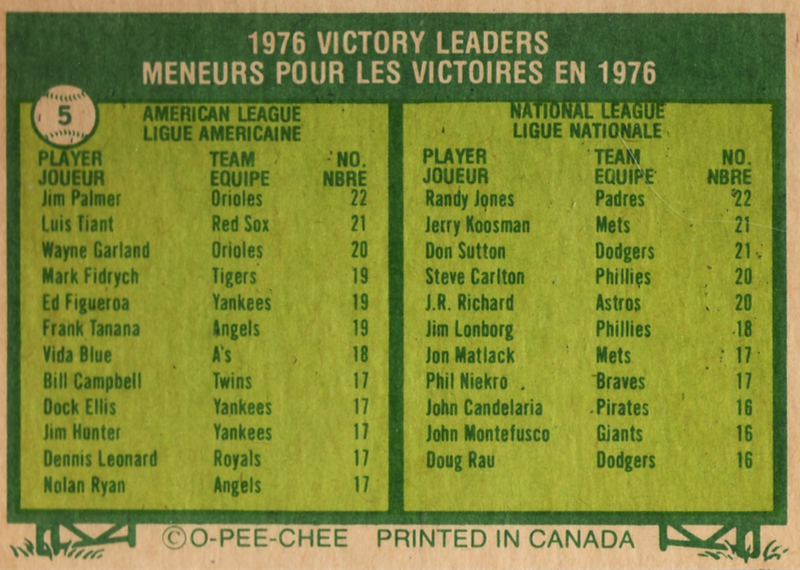 Other than their required French translations, O-Pee-Chee's 1976 set matched Topps player-for-player, shot-for-shot, and (ugh) airbrush-for-airbrush. 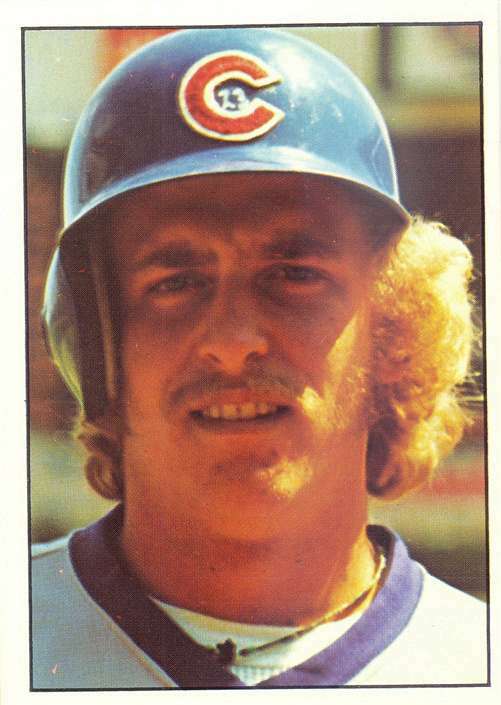 Check out the blurred "batter" that #5's art editor inserted, weird helmet and all. It's a baffling addition to that standing pose and Tom would be better served with a full windup. Why, Topps, why? 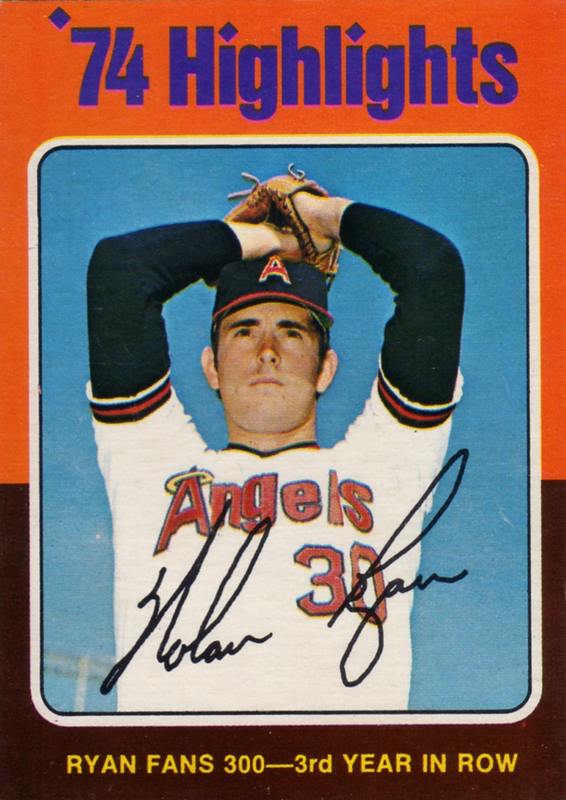 I picked this card in part to recognize 2011 Hall of Famer Bert Blyleven, another of a pitching handful to dominate batters one-on-one, year-after-year. 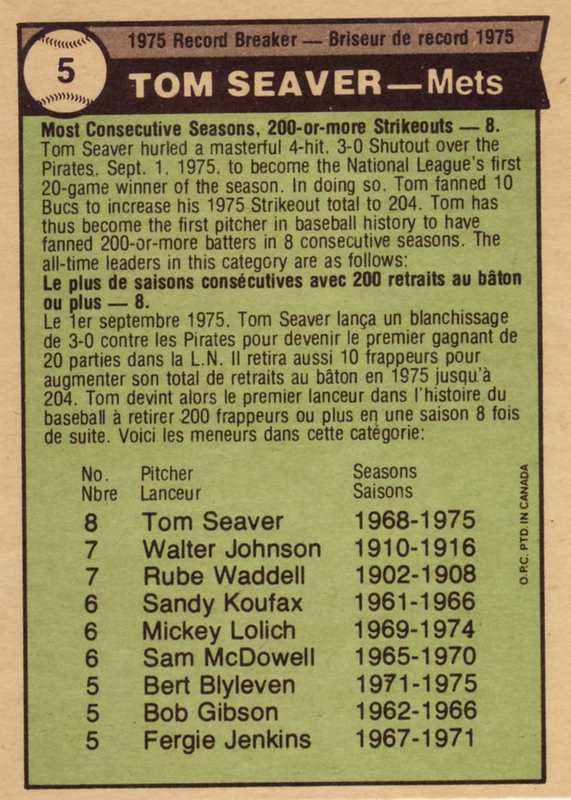 Both Seaver and Blyleven ran active 200+ K streaks as of the card's printing and then extended them into 1976, totaling 9 and 6 seasons respectively (career stats at B-R.com). Congratulations, Bert! Value: Hall of Famer or not, mid-70s cards don't cost much; 1976 Topps #5 is just 25 cents at Check Out My Cards. OPC versions are harder to find, but not much more valuable.